Property adjoins Catoctin Mountain Federal Park. Short drive to Cunningham Falls State Park with additional hiking and horseback riding trails. Stocked trout stream nearby. In center of Civil War country! Gettysburg, Sharpsburg, Antietam, Frederick and Monocacy Battlefields. Antiquing, Golf, Outlet shopping. 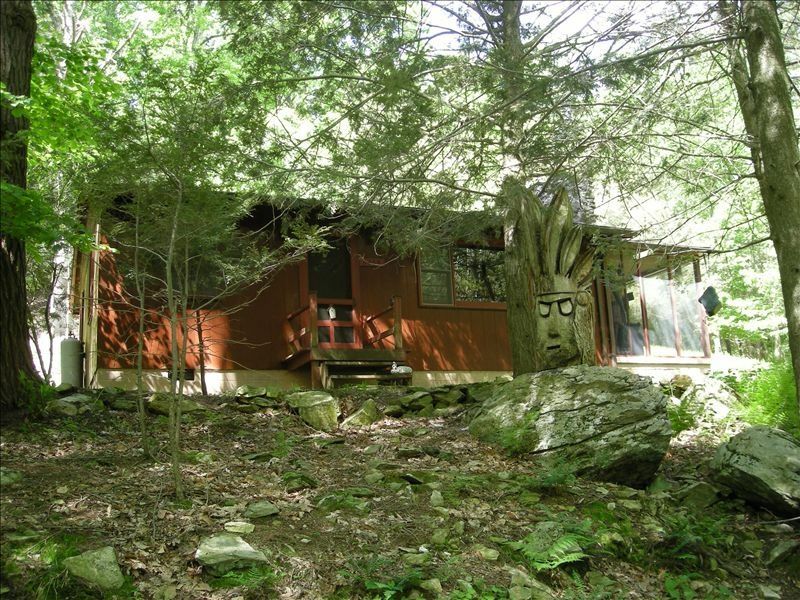 Ski Liberty, Whitetail Ski Resort, scenic drives and excellent local restaurants. The annual Catoctin Colorfest will be held in October . Over 350 juried arts and crafts will be exhibited in two areas in the Town of Thurmont. Both areas are within walking distance. The craft areas are the Thurmont Community Park and the Guardian Hose Company Activities Grounds. Admission to both of the craft areas is free. Dan & I have always loved the outdoors, especially the forests. So, when he found this property, it was like it was destined for us to live here. & here we are, 12 years later, still enjoying our little piece of Heaven. Lots of upkeep & work I grant you; but well worth all of our efforts!! When we purchased the property, there was this little weekend cabin placed on the second parcel. Dan & I lived there while building our home for when he decides to retire. If ever! Some years ago, we decided to share the cabin & the quiet & solitude that we enjoy so much. Plenty of wildlife & birds to observe. The sounds of the creek alone are enough to make the tension disappear. It's just a peaceful place to kick back & enjoy yourself or a good book or reconnect with family or each other. In this hectic life we live, nowadays, it's nice to know there is a quiet little place to escape to Revuenate, relax or take a much needed walk in the woods. No washer or dyer @!the cabin Laundromat in town of Thurmont 7miles from cabin. Large fairly spacious. No ice maker. ice trays are available. Try to keep staples of flour, sugar, oil, salt & pepper/seasonings on hand. Condiments of mayo, ketchup mustard. Small course in town of Thurmont maybe 8-9 miles from cabin. On of my best friends had a hole in one there!! Small babbling creek with 2 hammocks to enjoy backyard fire pit with chairs tables Totem poles Bridge farther down the lane crossing the creek with seats & small picnic area & another fire pit. Lots of areas to walk or hike. Biking 4 miles through the scenic park. Cunningham Falls Park nearby with kayaking beautiful scenery abounds. Local wineries local restaurants No hunting allowed! Our stay in a little piece of heaven! First off we enjoyed the fact that this house was so far off of the beaten path. The home owners had provided just about everything we could of possibly needed for our stay. Waking up to to the sounds of the flowing creek was enjoyable. Also the wild life came to visit every morning and night. We travel for work so I’m going to try and stay here again for our next trip to that area. Absolutely amazing place. Great cabin in the woods. It felt secluded, but close to stores and such if a food run was needed. I have been twice and hoping to go a third time in the Summer. We appreciate your kind review. & are so pleased you & your family enjoyed yourselves. Thank goodness you booked in between the snow storms!! Rustic, Native American decor cabin and surrounding mountainside was the perfect retreat and area to explore. Owners are extremely friendly and helpful. We spend a cozy weekend despite chilly temperatures. Plentiful firewood was a definite plus! We've stayed at Raven Haven now 3 times and have loved it on each occasion. It blends a nice mix of rustic with enough amenities that you are still comfortable. Their property is gorgeous and ideal for our two dogs who always have a blast. We'll definitely make another trip back. Thank you ! We appreciate your patronage!! & are delighted you & the pups have enjoyed our little piece of normalcy !! We're always here when you have the chance to slip away !! Take care !! Wonderful cozy cabin in an utterly delightful setting. The dogs loved it too! Hello again! Thank you so much ! We're happy you enjoyed your stay! Hope to see again sometime! Tale care! The Cabin is exactly what needed to get away. Peaceful, beautiful, and secluded. Sometimes you don’t want to hear anything but stillness, and nature is what is needed to feel normal again. If that is what you need too, then you found it! Raven Haven has a storybook like quality to it. Soak it in. You don’t find places like this every day. The creek has a rushing sound you can hear from the cabin and the trees cocoon you in your own little world. I couldn’t get enough of looking out that big window to the scenery below. The cabin is well stocked with everything you might have forgotten at home so pack a little lighter. We spent Thanksgiving here and were able to make a nice meal with ease. We made a fire and watched movies one rainy day. Honestly, we only left once to check out the antique mall 15 minutes away. The only thing that disappointed us was that we had to cut our stay a day early because of something back home. The cabin is well loved and the land is a magical place. We hope to visit again in the future. Thank you Deb & Dan for sharing your lovely cabin. We enjoyed our stay. Oh my goodness you are nice! Thank you for your generous review! We are so pleased you enjoyed your stay with us! Take good care we welcome you anytime! Forrested land with trails for hiking with country setting. State & federal parks to visit Cunningham Falls, Catoctin Park has plenty of trails plus biking. Wonderful country buffet in town with a large salad bar, homemade breads, soups nice dinner buffet with great fried chicken with all the fixens Lots of pies, cake slices, pudding & icecreams. Shamrock Restaurant just off rte 15 nearby with great seafood & prime rib dinners. Small salad bar with homemade breads & pies. Nice Irish bar or upper scale dining area. Plenty of small towns to visit. Or try downtown Frederick. Antiquing, Civil War Medical Museum Plenty of history. Catoctin Zoo for a nice afternoon out. Even Sultan the camel to ride or on the wildlife ride. Hand feed him or the buffalo. Stocked trout stream nearby off rte 550. Will need to pay for a license @ the Hardware store in town. Civil war country, , Antietam, Frederick, Gettysburg Monocacy, New Market, Sharpsburg, Also outlet shopping in Gettsysburg & Hagerstown, MD. $125/night (3 night minimum) .. $800/week $200 security deposit required; will be returned after inspection. Check in is 4pm and Check out is 11am Rates increase September-December $150/night $900/week NON SMOKING $10 per night per person over 4 people Note: Until confirmed, rates are subject to change without notice.